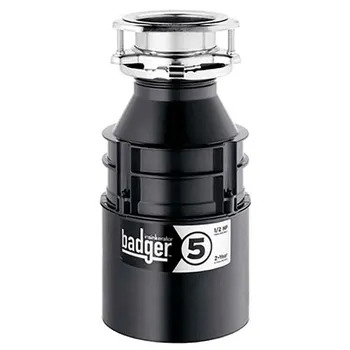 The Badger from Insinkerator is one of the best-selling models of garbage disposal in the US. The Insinkerator Badger 5 can be seen as a typical representative of quality and sensible cost of the whole series. There are many reasons why customers see the Badger 5 as one of the top disposal units even though the model is more than 10 years old. One of them has to do with the moniker of Insinkerator, the first waste disposer company there is. Founder of the company, John W. Hammes, invented the first garbage disposal ever in 1927 for his wife. He went on to develop his machine and launched an appliance business in the next ten years. Regarding the brand’s long history, Insinkerator has more insights on waste disposing than any company out there. Not only that, years of service have given Insinkerator deep understanding into homeowners’ needs and requests, which makes them a company to be trusted to old and new customers alike. Over almost a century, the company has worked to provide kitchens with both durable build and satisfactory shredding in their products, suitable for all pockets. The Badger series and the Evolution series show that. Insinkerator Badger 5 is no stranger to waste disposal enthusiasts. The unit is with simplicity in designs, durability in construction and appropriate strength in motor selection. Let’s dig deep into the machine to see why, apart from the fact that Insinkerator is one reputable company, the unit is still one of the best on the market. The most important part of a garbage disposal is easily the motor, as it usually is for any electrical machinery. It is the mechanical heart, the soul, the everything. So it’s only logical to talk about it first. Insinkerator Badger 5 possesses a ½ HP Dura-Drive ® induction motor, spinning at 1725 rpm, unlike disposers from Waste King which carry permanent magnet motors and always spin faster than 2500 rpm. Let’s take the name part by part and get a better look at the core of your potential future garbage disposal. ½ HP is about 370W. 370W is not exceptionally strong or anything (the average blender/mixer is around 900W), but it sure is sufficient. Hands in hands with the grinding chamber (which is completely different from the blades of blenders or food processors), the machine has enough tools to finish the job with ease. Truth be told, sure it can grind them all up, but I would not go as far as ruling out all possibility of jamming caused by the same garbage that the machine is supposed to manage effortlessly. Now, Dura-Drive ® Induction Motor. Dura Drive technology is actually an upgrade to motors in general, more specifically to the drives. It involves improvements in precision and durability, thus efficiency. In the last 50 years, Dura Drive has become one of the top drive mechanisms and has been adopted by a variety of manufacturers in different fields. The ½ HP Dura-Drive ® motor offers an effective amount of power to deal with almost all types of food waste. Follow the suggested operating instructions and no major problem should present itself during the machine’s lifetime. Next is the second most important part of the machine: the grinding chamber. First off, it is completely distinctive to the blades assembly of a blender or processor. It doesn’t even have blades. Instead, it is a combination of a spinning plate, two impellers and a grinding ring. As the garbage touch the plate, the impellers will drive them against the grind ring, which has “teeth”, and break them down to small particles. The chamber is also constructed with galvanized steel. “Why not stainless steel?”, you wonder? First, galvanized steel is less expensive. Second, the corrosion resistant quality of galvanized steel, though not as strong as that of stainless steel, is sufficient under the conditions of a typical home. With proper care, as suggested in the manual, the motor and chamber can be fully functional for more than 10 years. Unless you frequently drop metal objects down the chamber, the coating is not likely to be damaged. Also, a chamber with that many grooves and corners will most definitely get jammed. But more on that later. One of the two major problems of garbage disposals is the noise they make when operating. Apparently, it is somewhat a signature sound of the appliance. However, in the last few decades, noise pollution has received lots of attention and efforts have been made to suppress such potential health hazard. As a result, the noise of disposal machines has recently been considered a concern. FYI, the volume of most household appliances, including garbage disposals, can only be harmful to human when we are exposed to the noise for at least 8 hours. That being said, a session with a garbage disposal is clearly longer than that with a food processor. So technically, you will still be exposed to a hell lot of noise. It’s something to think about. Here’s the other major problem: jamming. The Insinkerator Badger 5 will get jammed. That’s just factual. You either have to live with it or buy a high-end model, which has technologies specifically designed against such problem. But it’s not as annoying as it may sound. Don’t get me wrong, it IS annoying. All I’m saying is there are steps we could take to reduce the risk, and fixing the jam is not that challenging either. You could take a look over here if you’re interested. Prior to a buy, homeowners should pay a bit of attention to the space that the appliance is going to take. As cliche as it may sounds, size does come proportional to power. But the issue should not be as serious with the Insinkerator Badger 5 as it is with stronger machines. The model is the most standard disposer out there on the market. It is designed to slide in your under sink cabinet like a bucket. Literally. The unit is 12-5/8″ (32 cm) in height and 6-5/16″ (16 cm) in width, precisely similar to a small cylindrical bucket. The average base cabinet is 36 inches high and 25-¼ inches wide, which will still have plenty of room left with the Badger 5 inside. As stated before, the model is the most standard disposer there is. By the way, the machine is not light nor heavy. It’s about 14 lbs (6.3 kg). But weight is not gonna be a regular problem since it will most likely stay in its little place for a long while. Now, if you didn’t know yet, there are actually two types of garbage disposal: continuous feed and batch feed. Our Badger 5 here is one of the continuous feed itself, which is the first type ever of disposers. Batch feed was introduced later, when the concerns over safety arose. Batch feed is evidently more advanced and definitely safer. While the continuous feed is popular and simpler to use, it’s prone to accidents. With the grinding chamber operating with or without the stopper in place, of course, things are bound to fall in if one is not mindful enough, things that can cause serious damage to the machine and, likely, the users. I, myself, am more of a fan of the batch feed mechanics. But, fact is, there are much fewer batch feed models than the continuous feed, which is unfortunate for the safety-conscious minds. If you’re interested, the Insinkerator Cover Control Plus is a promising choice. Insinkerator has been in the game for years. In fact, they made the first garbage disposal ever. Through years of experience, they are confident about their craftsmanship and do know a thing or two about how to please their customers. Insinkerator offers an exclusive “We come to you” 2-year In-Home limited warranty. The warranty provides toll free house calls (parts and labor) linking to a network of 1500 professional service agents who are certified to install, repair and replace Insinkerator disposers. If assistance seems necessary, you need only call their service line and get yourself informed with names and phone numbers that guide to a authorized factory nearest to your home. Regardless, customer service is never as good as it is promised. Sometimes, errors are to occur here and there. As trustworthy as Insinkerator is, it’s still wise not to keep our hopes up, lest we hastily misjudge. Overall, judging by the cost and what it has to offer, the purchase would be fair. If you don’t mind manual tasks, jamming shouldn’t seem too much of a problem. The unit is most suitable for an average home with three to four people, who only require a practical, standard unit and don’t wish to spend more than a hundred bucks on it. However, the noise, compared to other available units from different brands, is one flaw that you should be aware of. Other than that, the machine is not bad at all.